Be Aware. Feel Inspired. Get Involved. The Department has four certified Green Centers designated by the Maryland Association for Environmental and Outdoor Education: Watkins Nature Center, Clearwater Nature Center, Old Maryland Farm, and Patuxent River Park. The Green Centers support schools working toward the Maryland Green Schools Awards by providing guidance and empowering youth to make changes to reduce environmental impact, encouraging sustainability, and fostering environmental literacy. In addition, the Department has two Green Schools – Upper Marlboro and Glenridge Childcare Centers, with more to come. The Department’s Special Programs Division (SPD) has an ongoing partnership with Maryland Department of Natural Resources’ Conservation Job Corps summer program. The Division coordinates the placement of approximately 30 youth referred by the Department of Social Services. Participants engage in a variety of conservation projects and enrichment activities on park property. SPD and the Natural and Historical Resources Division (NHRD) also partner with Parkdale High School, the Prince George’s County Department of Environment, and the County’s Summer Youth Enrichment program to provide additional educational programs and conservation projects for local youth. NHRD also conducts a large number of environmentally-based educational programs for Prince George’s County Schools system, faith-based institutions, and others. In partnership with the William S. Schmidt Outdoor Education Center, Prince Georgeâ&#x20AC;&#x2122;s County classrooms are given baby Bluegill fish to raise. Students then visit one of several outdoor locations in the spring to release these fish into local streams, rivers, and ponds. 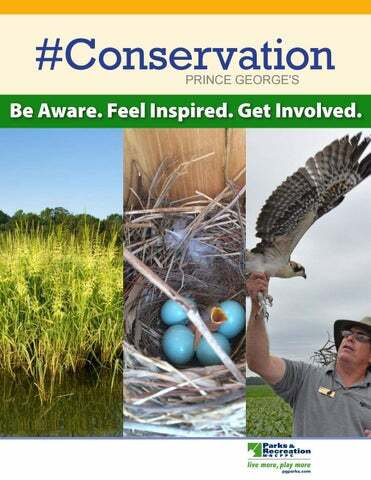 Participating sites such as Watkins Nature Center, Clearwater Nature Center, Patuxent River Park, and Bladensburg Waterfront Park also provide educational programming about conservation to the students. In collaboration with Eleanor Roosevelt High School, students participate in an ongoing study of salamander populations at Watkins Regional Park. Using the Cover Board Survey method, each year students visit the park on a weekly basis in the spring to check the boards and record the species of salamander found, as well as the number of salamanders. Salamanders are useful indicators of the biological condition in small streams. NHRD, SPD, and Northern Area Operations partnered with local environmental groups to host the first bilingual environmental festival, Festival del Rio, at Bladensburg Waterfront Park. The Senior Green Team is a group of seniors who work and play together by engaging in projects that protect, support, and preserve Prince Georgeâ&#x20AC;&#x2122;s Countyâ&#x20AC;&#x2122;s natural resources. The Team does basic trail maintenance, tree plantings, cleanups, bird house projects, and conservation educational outings. Park Rangers work in partnership with Patuxent River Park staff to host the Jug Bay 10K/5K Run for Wildlife. This event raises thousands of dollars to assist with conservation efforts on the Patuxent River and its watershed. The Department partners with thousands of environmental advocacy non-profits and community volunteers to assist with conservation projects, beautification efforts, and trash and river clean-ups. The Department is incorporating conservation ideals into its own design - literally. New buildings are being designed to meet LEED certification standards. The buildings are resource efficient - they use less water and energy and reduce greenhouse gas emissions. The Vansville Community Center meets LEED Gold standards and the Southern Regional Technology and Recreation Complex meets LEED Silver standards. Currently, the Southern Area Aquatic and Recreation Complex is being designed to earn a LEED Silver accreditation as well. The Watkins Tennis Bubble serves as a green technology demonstration center, which incorporates renewable energy features, green roof, water saving elements, and educational features. The Maintenance and Development Division (M&D)has identified priority sites and systems that are high utility users (based on size of facility, age of infrastructure, use, amenities, efficiency of fixtures) and is implementing energy efficient improvements. One outstanding example is the upgrading of interior and exterior lighting at the Prince Georgeâ&#x20AC;&#x2122;s Sports & Learning Complex ($162,000 savings per year) and gym lights at all community centers ($56,000 savings per year). 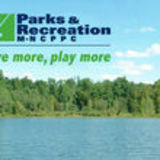 Over 50% of all community centers and 100% of park permit buildings are managed via programmable thermostats. This reduces our energy costs, as well as work hours, by eliminating the need to send a HVAC technician to sites to simply adjust temperature levels. When the Riversdale House Museum HVAC (heating, ventilation, and air conditioning) system needed to be replaced several years ago, the decision was made to install a geothermal system. Such a system uses the constant temperature of the earth as the exchange medium instead of the fluctuating outside air temperature. Geothermal is recognized by the United States Environmental Protection Agency as the most environmentally-safe, cost effective heating and cooling system on the market. Energy savings can be from 25 to 50 percent compared to conventional systems. The M&D Randall Farm facility is currently working on the development of a solar power farm on-site that will reduce energy costs, promote the use of renewable energy, and reduce our carbon footprint. All maintenance yards, under the coordination of the Fleet Manager, currently recycle used oil, antifreeze, hydraulic fluid, oil filters, batteries, tires, and scrap metal. NHRD oversees single stream recycling collection (paper, cans, plastics, bottles) at more than 100 staffed sites, as well as a number of area parks collecting hundreds of tons of recycled materials annually. The Public Affairs and Marketing Division has shifted to electronic social media advertising in place of print. In 2016, our campaigns reached 353,973 people on Facebook at a cost of just $4,722. The Department received a $250,000 grant from the Chesapeake Bay Trust to conduct storm water stewardship projects and educational activities within the Anacostia River watershed. Projects include the installation of rain barrels and cisterns, rain gardens, storm water management facility enhancements, tree plantings, and invasive plant removals. The Quick Connect water conservation project has been selected by employees within the Department. This pilot projectâ&#x20AC;&#x2122;s aim is to save money and improve storm water quality by installing cisterns to collect rain water from rooftops for use in irrigation of turf and landscaped areas. Since 1985, Patuxent River Park has constructed and installed osprey nesting towers along the Patuxent River to support the dwindling osprey population. In 2016, more than 200 chicks were banded and more than 304 nests were monitored along the river. The banding research provides valuable information about osprey ecology, including migration patterns and life expectancies. In partnership with the Maryland Wood Duck Initiative, the Natural and Historical Resources Division installs and maintains hundreds of Wood Duck nest boxes. After the nesting season, staff documents the number of successfully fledged ducklings. In 2016, almost 1,000 Wood Ducks hatched in the Jug Bay area and pond sites throughout the County. Bluebird populations fell in the early twentieth century due to aggressive non-native species out-competing bluebirds for nesting sites. Bluebird trails and frequent monitoring has helped the population to come back. NHRD and volunteers monitor hundreds of bluebird boxes throughout the County. The data is used to track status and trends in the reproductive biology of birds and study the current condition of breeding bird populations and how they may be changing over time. In association with Project Feederwatch, patrons at Watkins Nature Center are asked to record their daily bird observations at the bird feeder outside the center. Data is reported on the Project Feederwatch website in order to help track regional population trends and distributions. The Department has worked to establish pollinator meadows, gardens, and Monarch Waystation areas into natural meadows and gardens. These habitats provide valuable sources of food and shelter to wildlife including important insect pollinators. In years when Monarch butterflies are abundant, naturalists tag adults as part of a citizen science project that assists with conservation of this fragile species. Old Maryland Farm, Patuxent River Park, and Watkins Nature Center also work with Monarch Watch and tags newly emerged Monarch Butterflies and send data to Monarch Watch to help track their fall migration patterns. By reducing the mowing rate to once a year on select grassy areas, less fuel emissions are generated to manage them. In an attempt to increase survival of frog tadpoles and to involve students in the education of habitat conservation, teachers in local Prince George’s County schools are given tadpoles to raise in the classroom. Adult frogs are then released into Watkins Regional Park. After years of heavy grazing by resident Canada Geese, the wild rice in the Jug Bay marshes was depleted to just 30 acres in a 10-mile stretch of river. Since 2000, Patuxent River Park has restored the wild rice to its original 300+ acres through fencing, seed collection and dispersal, and goose population management. Volunteers, students, and grant-funded interns all assist in this ongoing project. Wild rice is a valuable wetland plant that provides an abundant food source to migrating birds each fall and improves water quality through excess nutrient uptake. Park Rangers continue to take the lead on dealing with the control of nuisance wildlife. They respond to all calls regarding these issues on park property. The Park Rangers monitor areas that are known to attract geese and have an egg addling program to control numbers of resident geese. In partnership with the USDA, they also perform periodic round ups of resident geese when numbers become unsustainable, with a focus on critical natural areas and prime nesting grounds such as golf courses. The Park Rangers and Park Police conduct a managed deer hunt to address unsustainable deer populations on park property that pose both a safety issue to motorists and an environmental impact. The program takes place at Enterprise Golf Course, Henson Creek Golf Course, and Oxon Hill Manor - all sites where the current number of deer per square mile far exceeds the sustainable population level. Deer taken during the hunt are processed and the meat is donated to local food banks. The Department, primarily through the NHRD’s Park Ranger program, oversees the inventory, assessment, and control of non-native and invasive plants in coordination with nature centers and waterfront parks with assistance from volunteers throughout the County. In partnership with the Maryland Big Tree Program and the Prince George’s County Forest Conservancy District Board, the Park Rangers measure, catalog, and tour the largest and most notable tree species in Prince George’s County. This program brings awareness to the importance of tree conservation and educates us on the large variety of trees that inhabit the area.